We saw the buffleheads again on our walk this afternoon, but they were even farther out in the water than yesterday. So instead I’ll show you a photo of a different species I saw today, although this photo is not from last week: a downy woodpecker. Female downy woodpecker, October 27, Madison, Wisconsin. Why are downy woodpeckers called “downy”? While I may not know where hairy woodpeckers get their name, the source of this bird’s English name is much clearer. Just look at the downy tufts around the base of her beak and billowing out from beneath her wings. 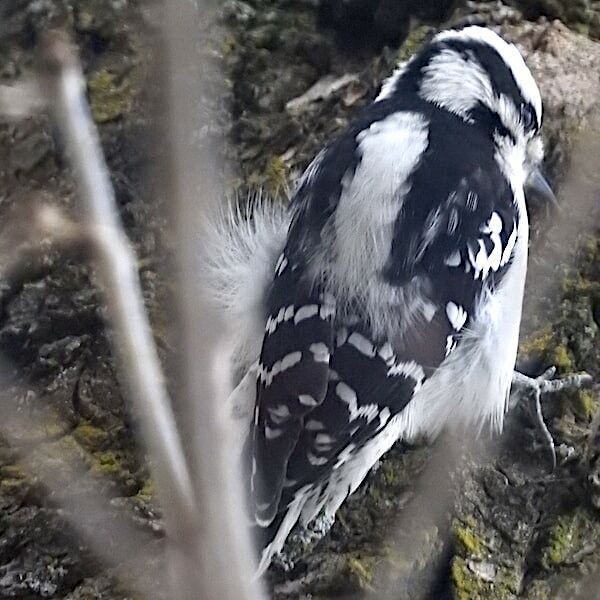 Males have the same downy feathers, and also a little red dot at the back of their head. Ignoring the down, downy woodpeckers look much like miniature versions of hairy woodpeckers. Both species are members of the same genus, Picoides. Downy woodpeckers are Picoides pubescens and hairy woodpeckers are Picoides villosus. In a rarity for scientific nomenclature, their Latin names mean pretty much the same thing as their English names. Picoides comes from picus, which means “woodpecker”; pubescens and vollusus come from different Latin root words for hair. Downy woodpeckers are the smallest woodpecker I see on a regular basis, just about the size of a sparrow. When it’s cloudy and gray like today, it can be a challenge to identify them. It fact, I first mistook the one I saw this afternoon for a sparrow or other little brown job, because it was sitting on a bare branch and I couldn’t make out its distinctive black-and-white pattern against the glare of the cloudy sky. When the downy woodpecker began to hop toward the trunk, I began to suspect its true identity, and finally when it was next to the truck I got a better look and saw that it was most definitely not a sparrow. As I mentioned the other day, they seem to travel in larger groups than the other woodpeckers. I’ve counted as many as ten on one tree before, and with all the flitting around they do, I’ve probably missed a few in my counts. And like most small birds, they are pretty darn adorable. Here’s the All About Birds link for downy woodpeckers if you want to learn more. You can read more of my birding posts here.